Be inspired by hopping at MOJO Monday 104 where you can have a lovely idea every Monday for a new sketch for your card. And if you are looking for what color to use for the card, why not drop by at SPCC #15... I surely have fun playing on this both amazing sites and combining the challenges. What a great card Vanessa! Very elegant! Love the sentiment! Thanks for playing at SPCC! Your talent amazes me. Once again fantastic card! I'm always excited to see what you have to show us! This card is beautiful, and I love the open-ended sentiment. 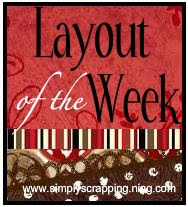 Love how you used the colors this week. this is a fab card!! glad you keep coming back to play with us at SPCC!! Wow -I love your work. Great card. Beautiful Card! I love the sentiment! This is gorgeous! You are the queen of the borders. Always so creative! Thanks for playing along!! !